Would you like to have the kind of faith that can move mountains and take victory over every situation? In this episode of Believer’s Voice of Victory, Gloria Copeland and George Pearsons teach you the first steps to developing an uncommon faith that will catapult you to new levels! Are you ready to build stronger faith muscles? If so, you don’t want to miss these next steps to developing an uncommon faith with Gloria Copeland and Pastor George Pearsons on Believer’s Voice of Victory. Don’t miss it! In this episode of Believer’s Voice of Victory, Gloria Copeland and George Pearsons will give you the final steps to developing an uncommon faith that brings extraordinary results! No problem is too big for the God-kind of faith—so start building your faith muscles today! In this episode of Believer’s Voice of Victory, Gloria Copeland and George Pearsons continue teaching about how to increase your faith in God with the Word of God. They explore Abraham’s stand of faith as outlined in Romans 4 and discuss how the passage impacts your Christian walk. 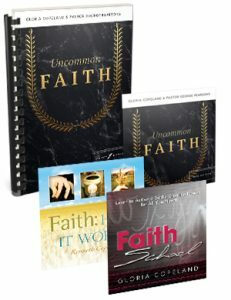 Gloria Copeland and George Pearsons show you how to release your faith for prosperity in this last episode of the How to Develop an Uncommon Faith series on Believer’s Voice of Victory. Tune in and continue learning how to increase your faith in God for powerful results! Catch up with the previous week in this series, What is Uncommon Faith?.